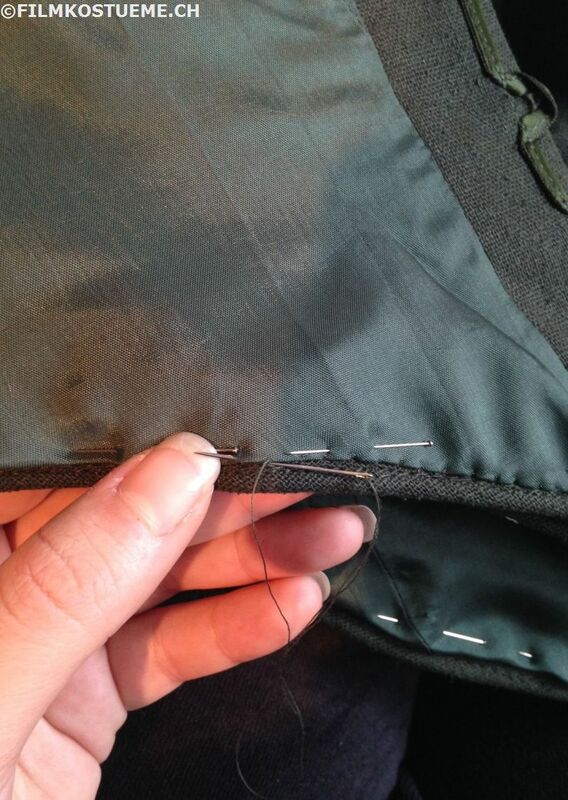 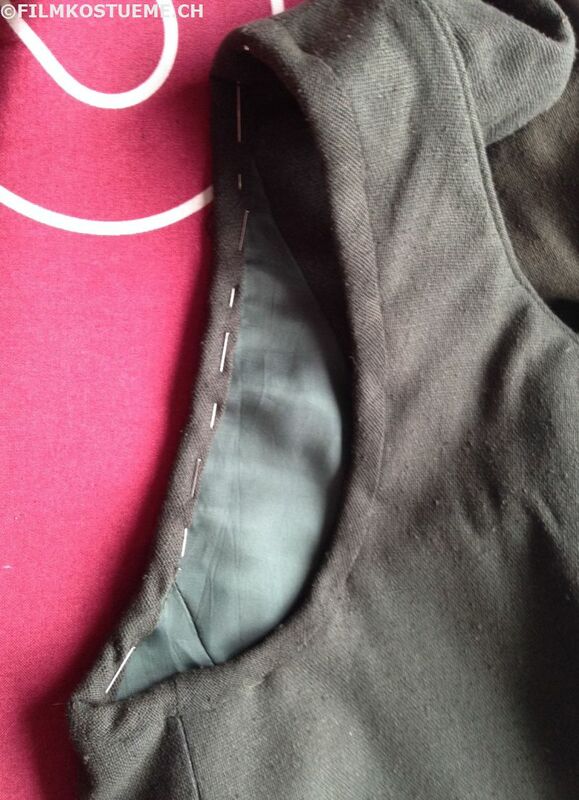 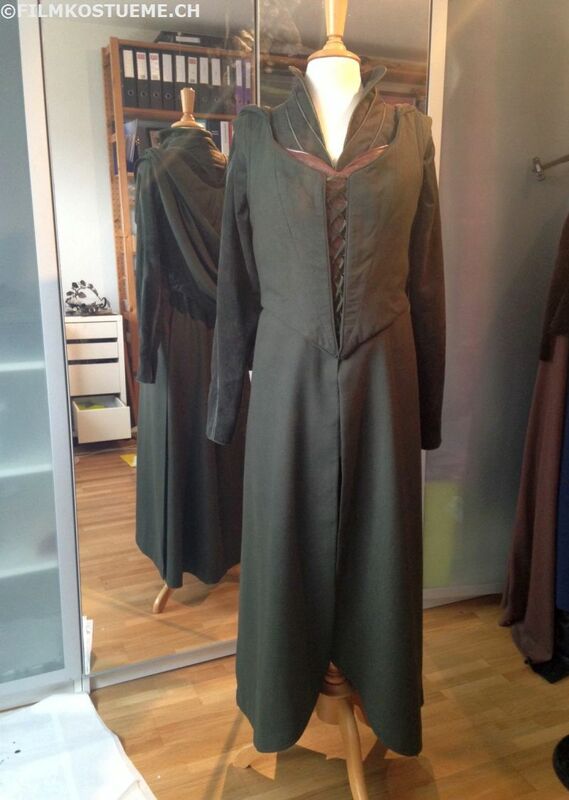 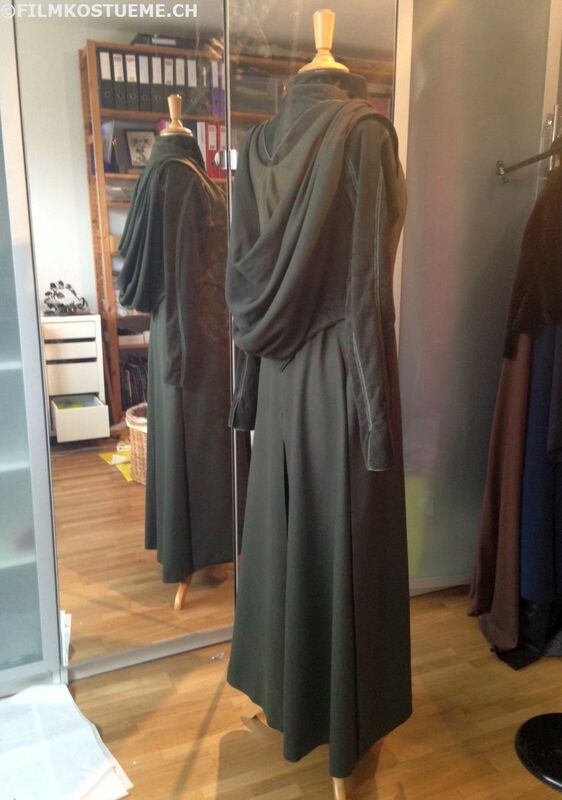 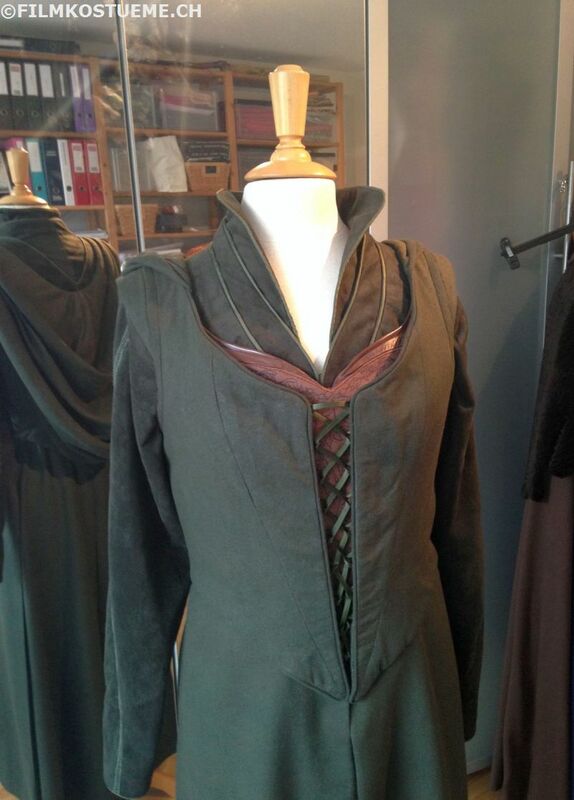 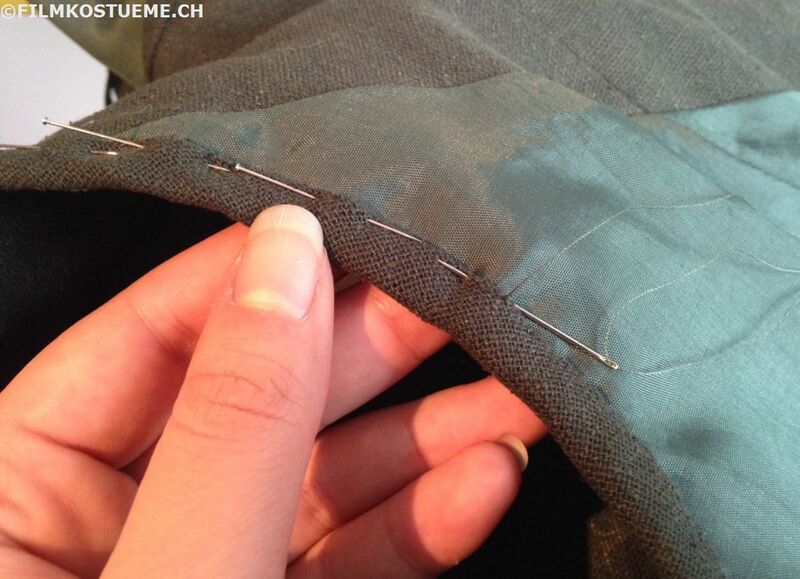 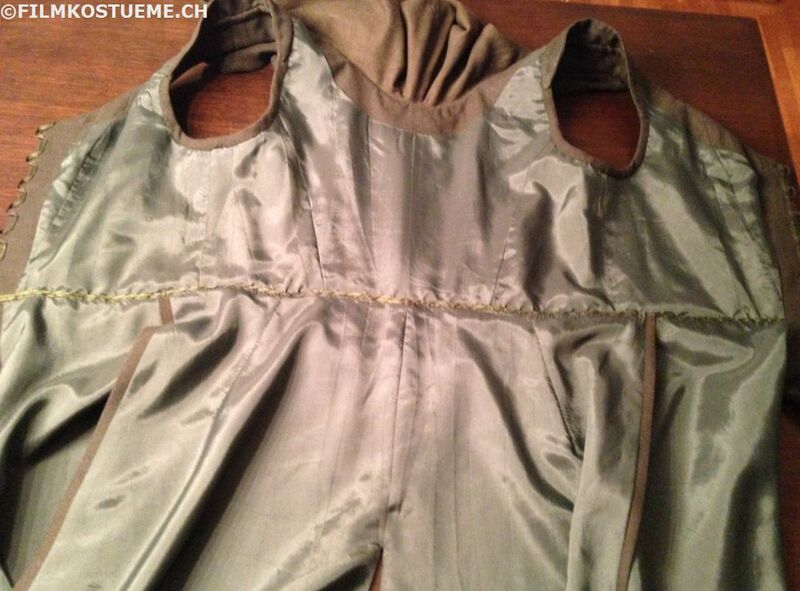 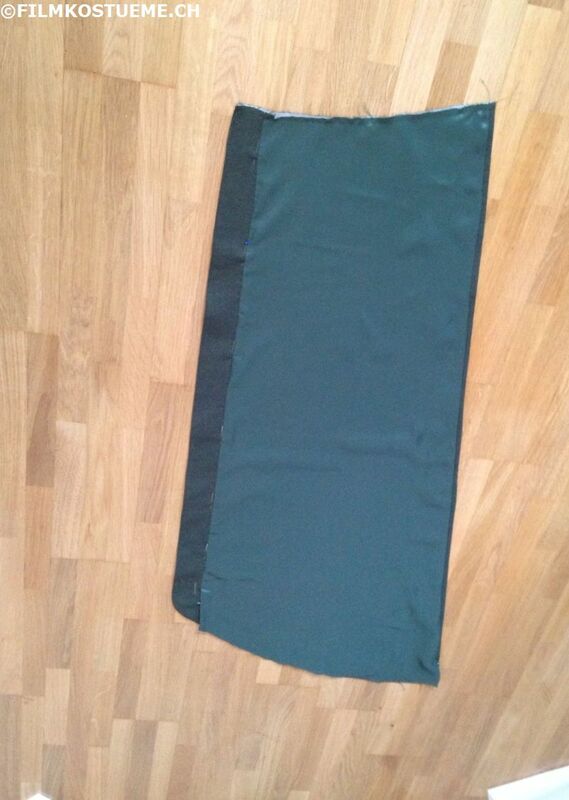 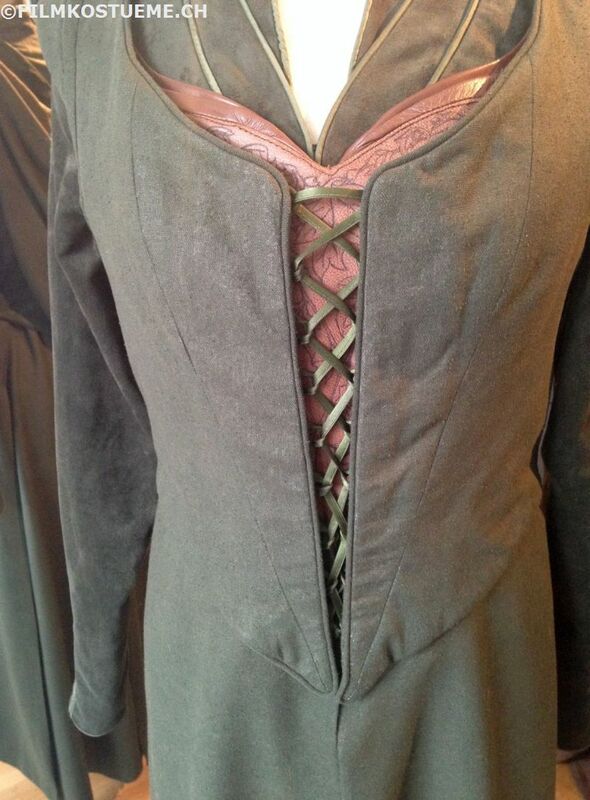 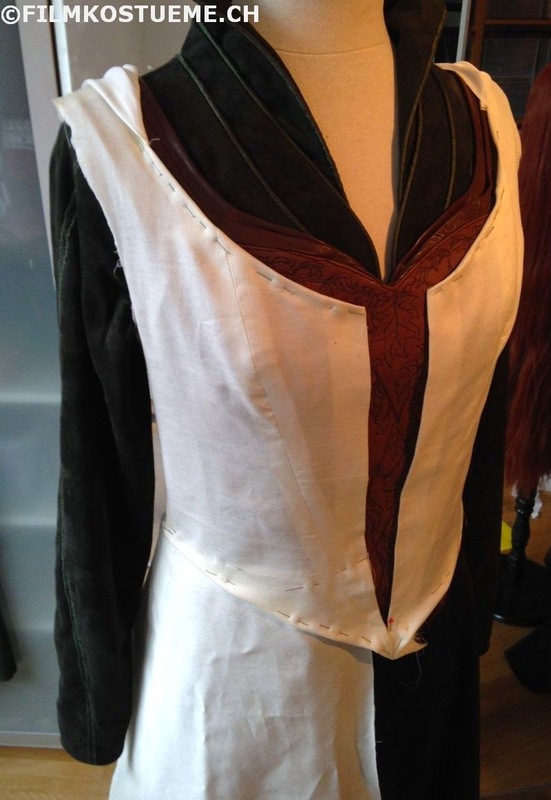 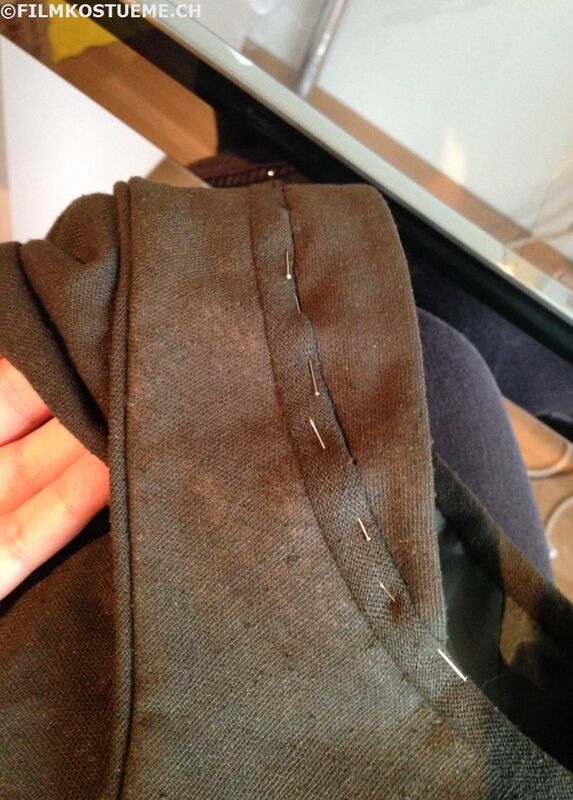 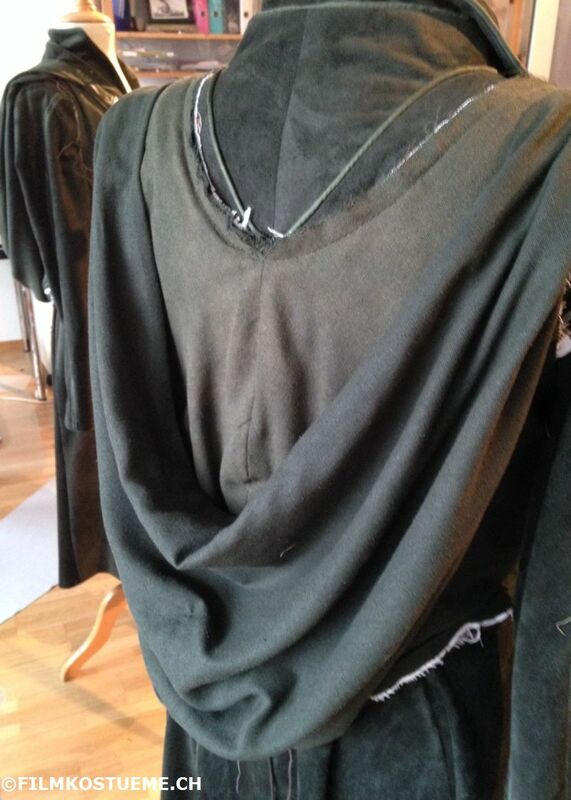 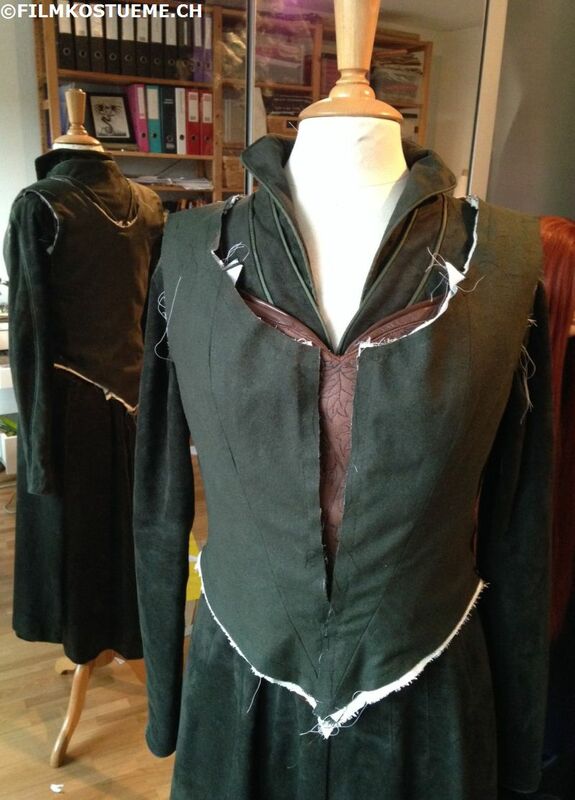 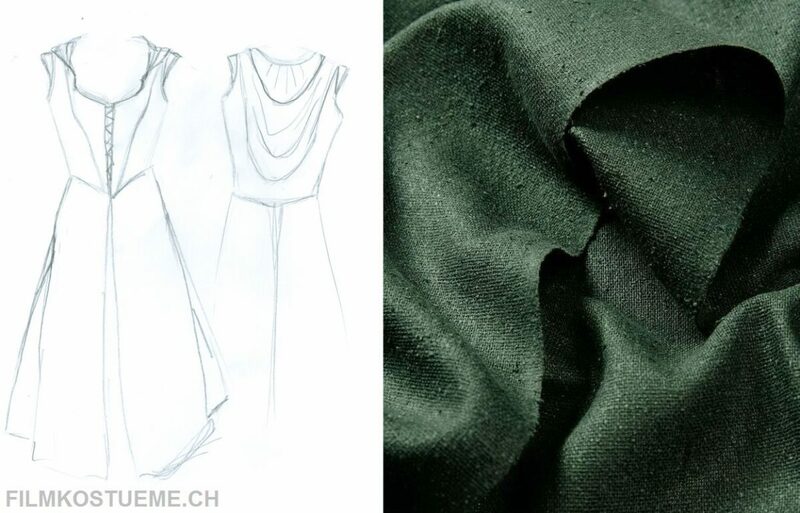 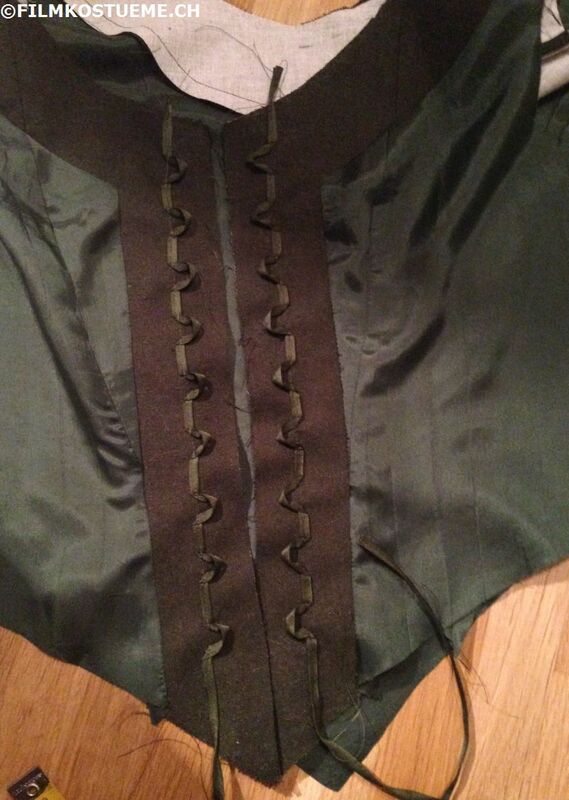 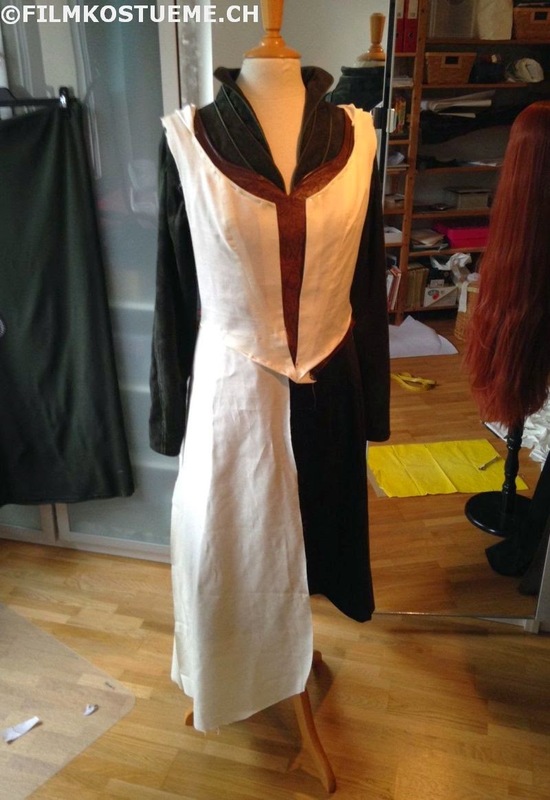 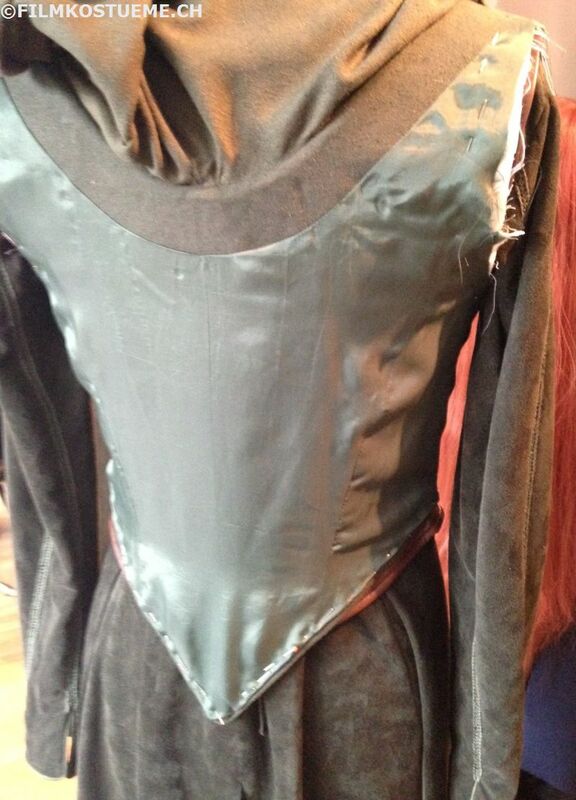 A Tutorial on how I made my Tauriel traveling cloak. 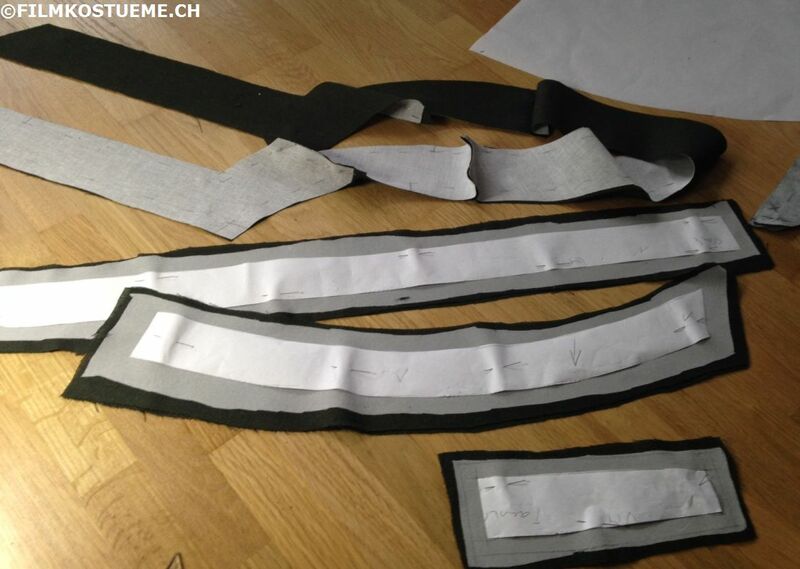 I always do a pattern test/mockup before actually cutting the real fabric. 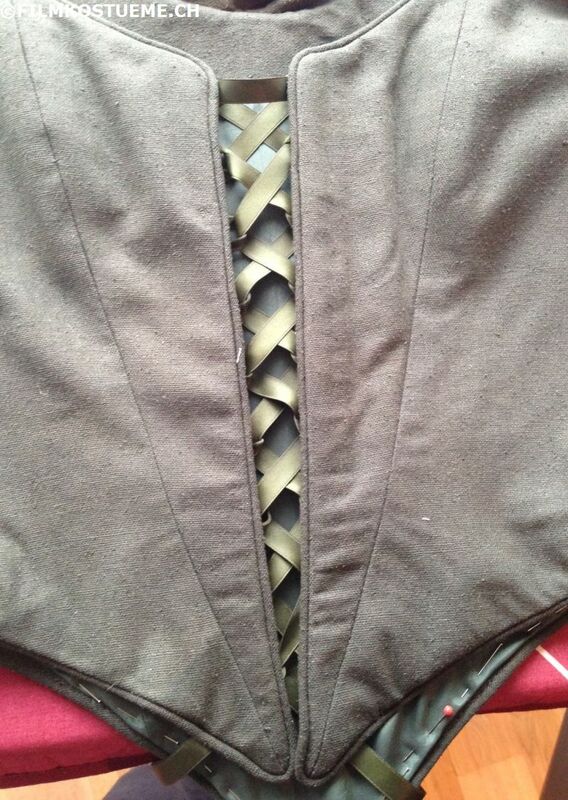 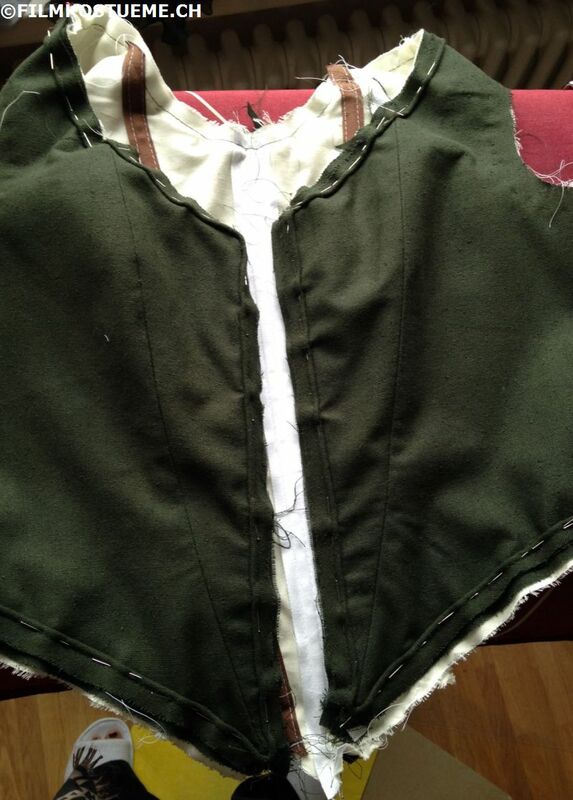 After testing my pattern I started with the bodice. 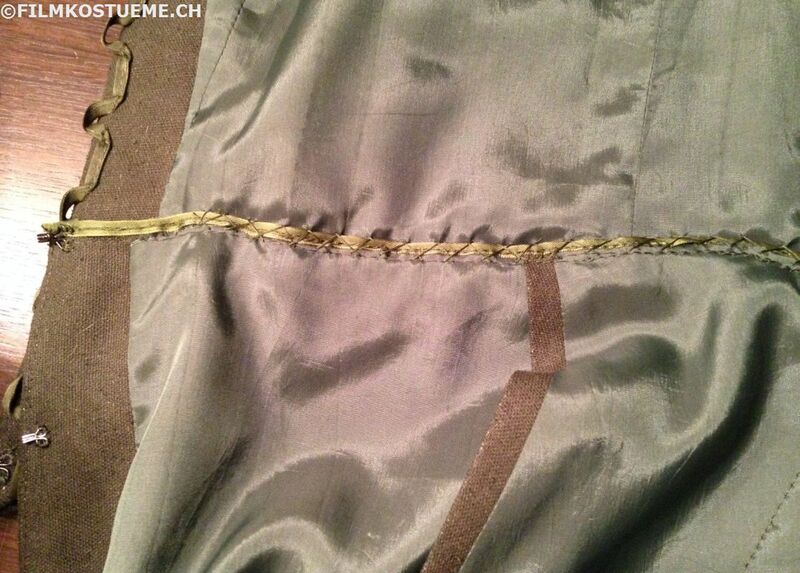 As my raw silk was very thin and light, I had to stiffen it up a bit. 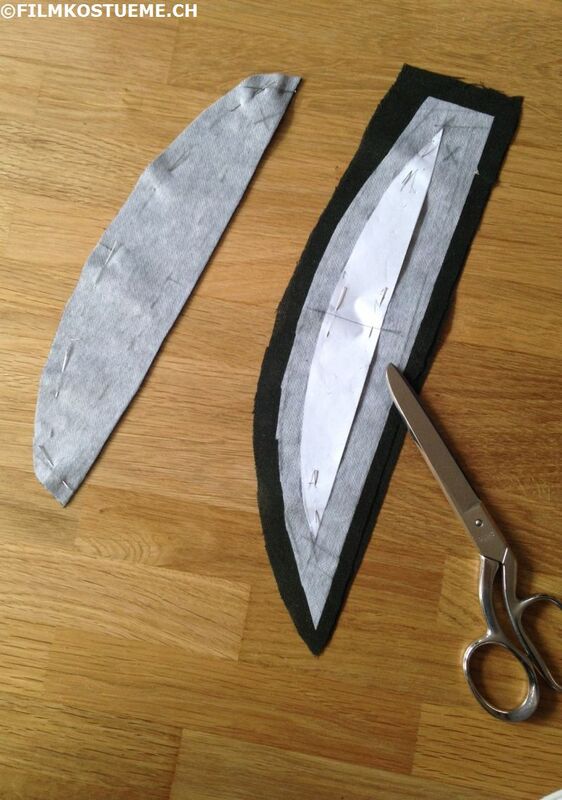 I ironed on an interfacing for starters. 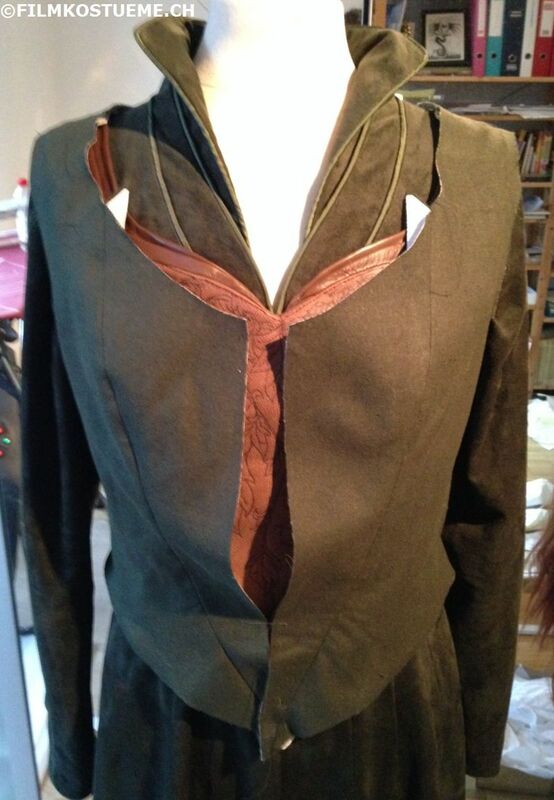 Then I put the layers together et voila, it looked much better! 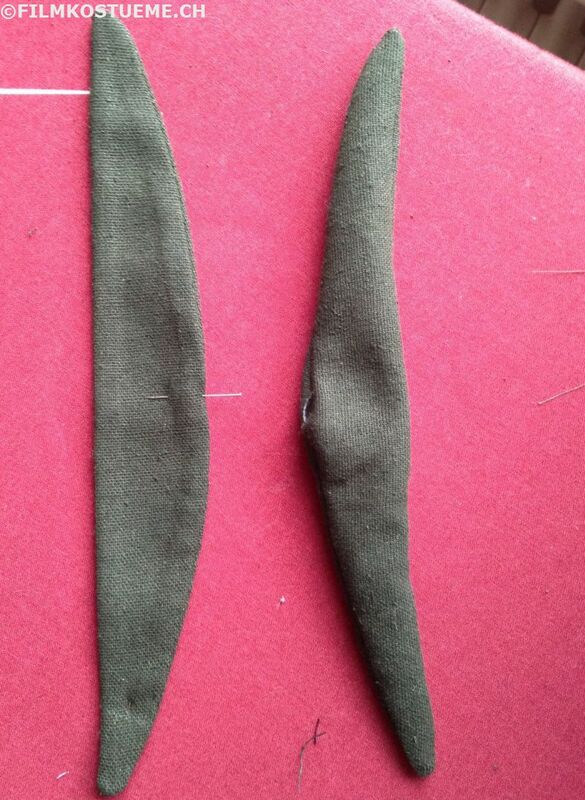 And here already pinned around the edges and ready to be sewn. 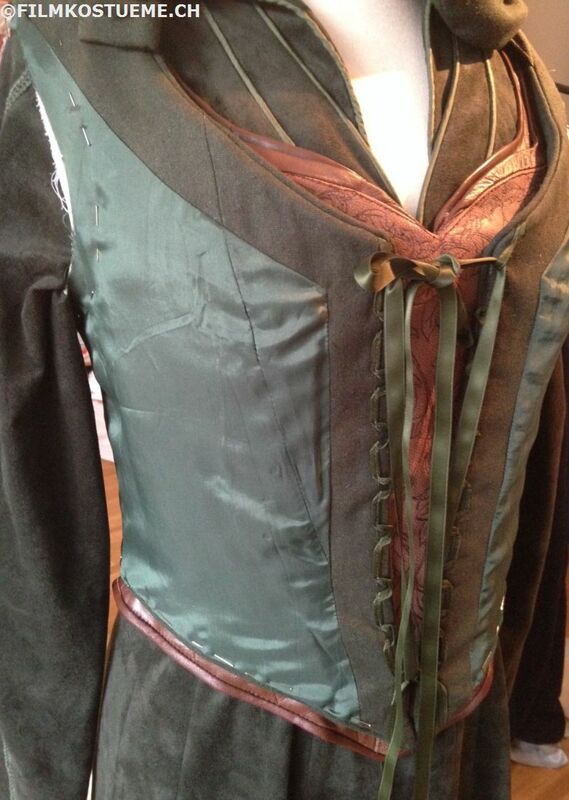 I knwo maybe not the moste exciting part, but still pretty important in the costume process. 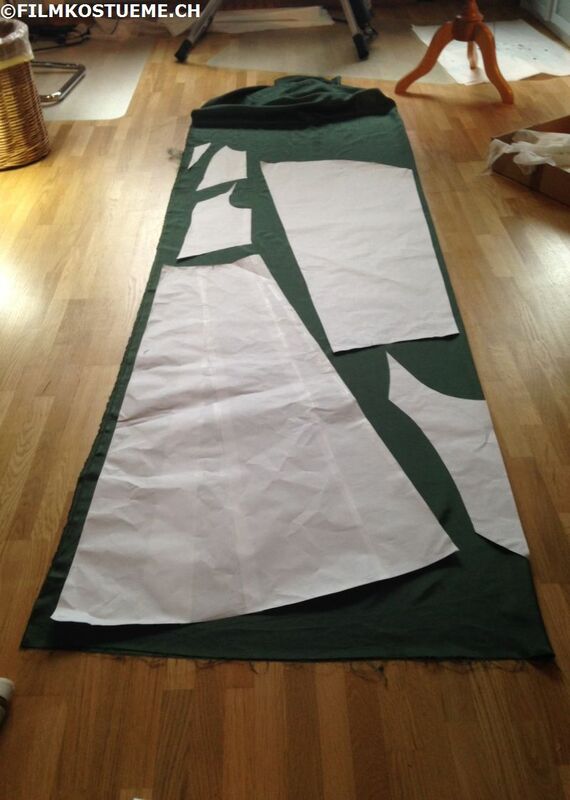 Here I'm cutting the the facing (I ironed on some light interfacing for the skirt facing and stiffer interfacing for the bodice ones) and the lining fabric. 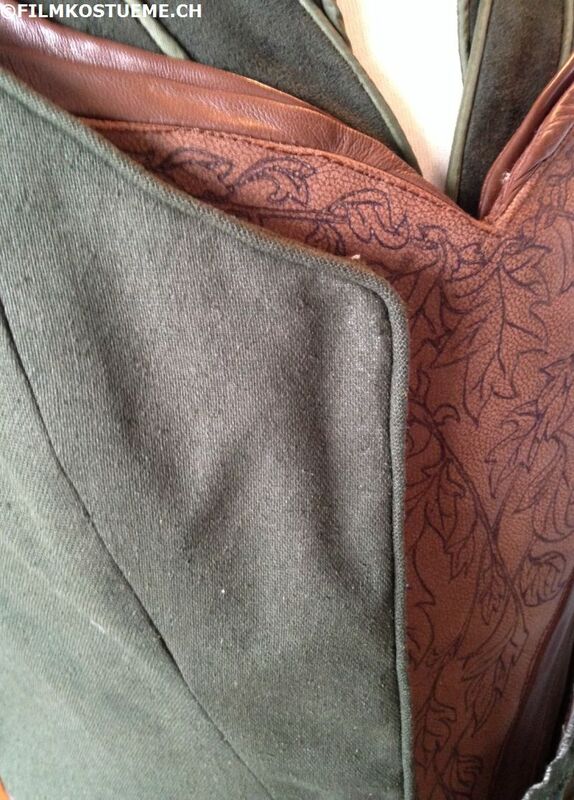 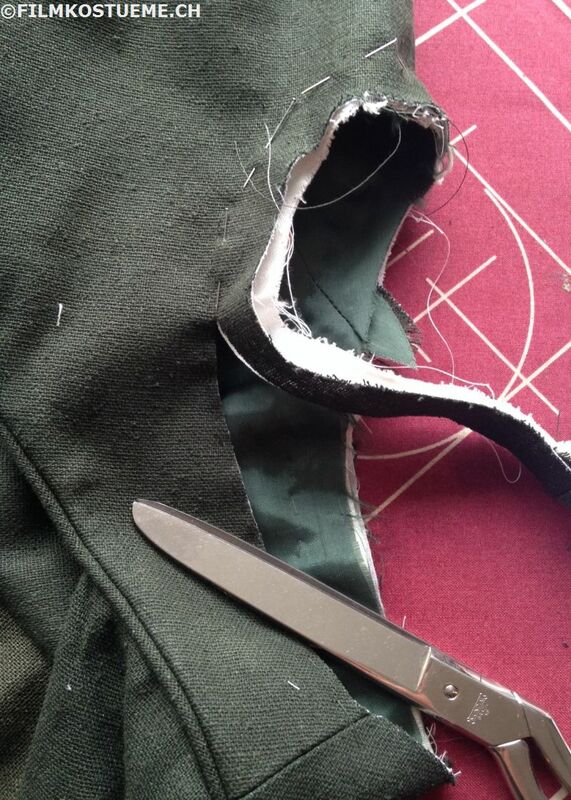 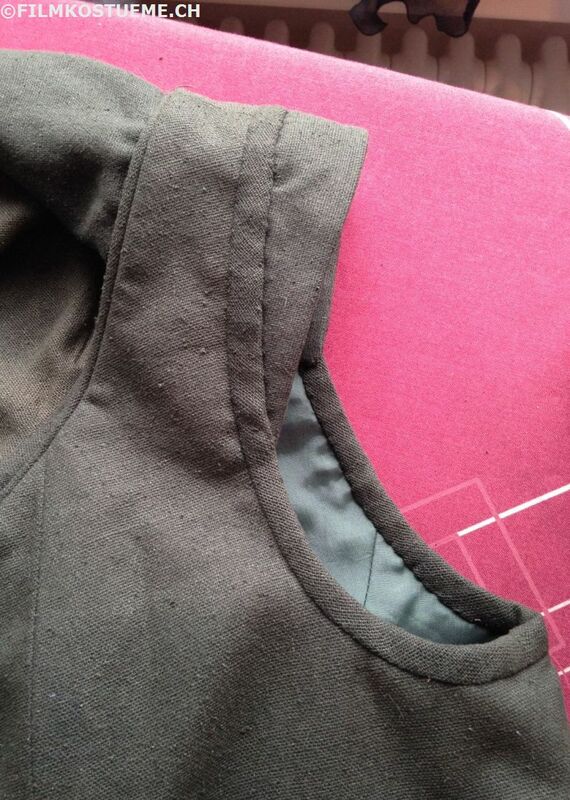 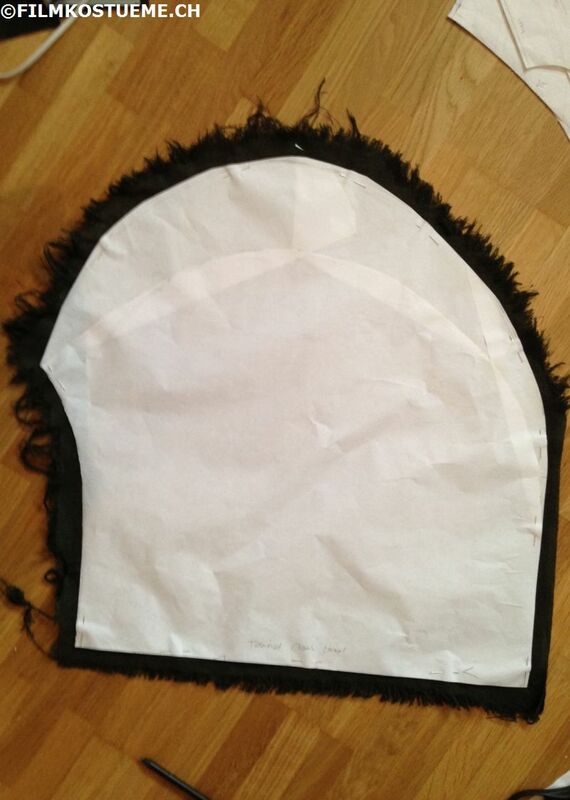 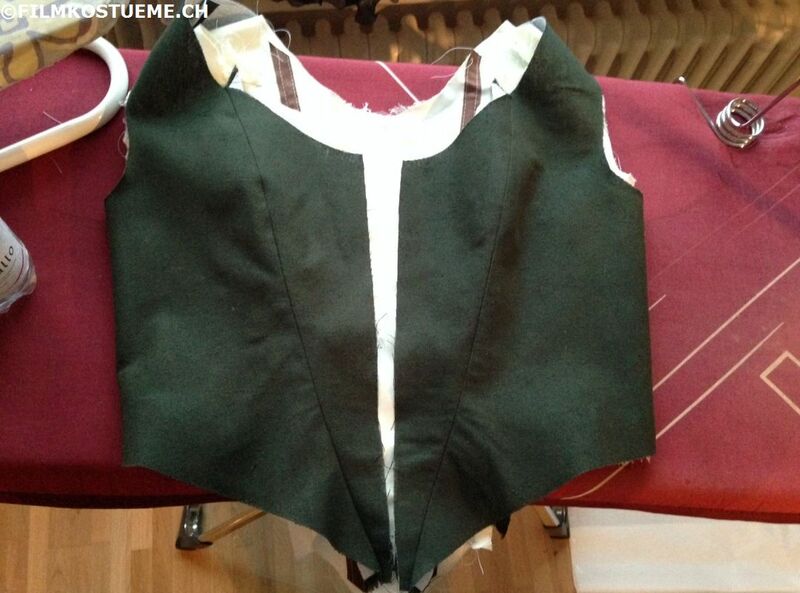 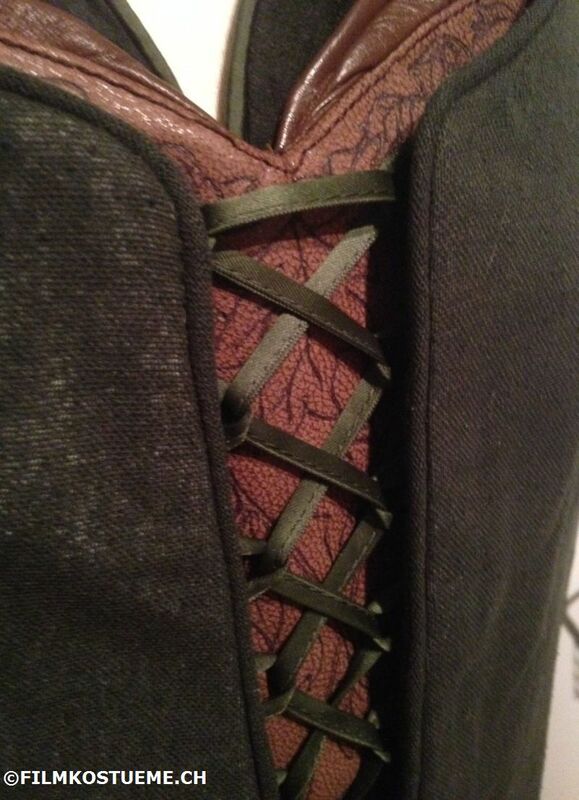 The complete bodice lining. 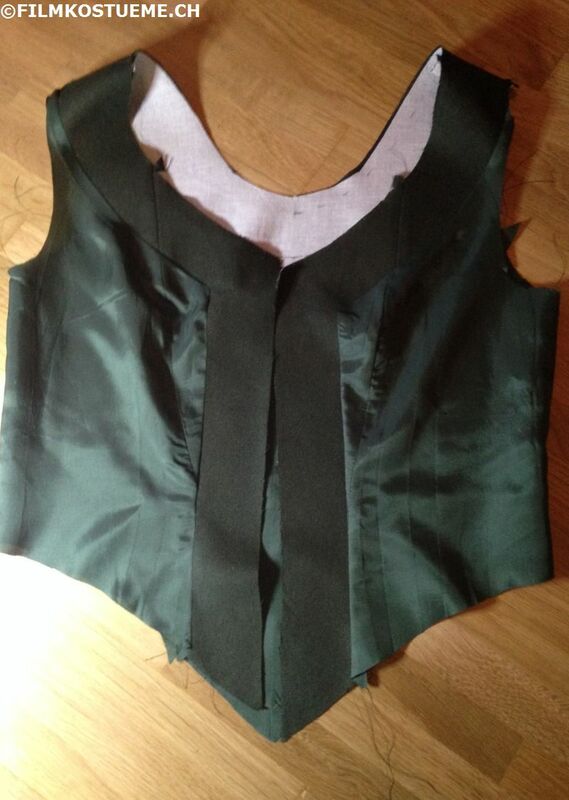 Before sewing it to the bodice. 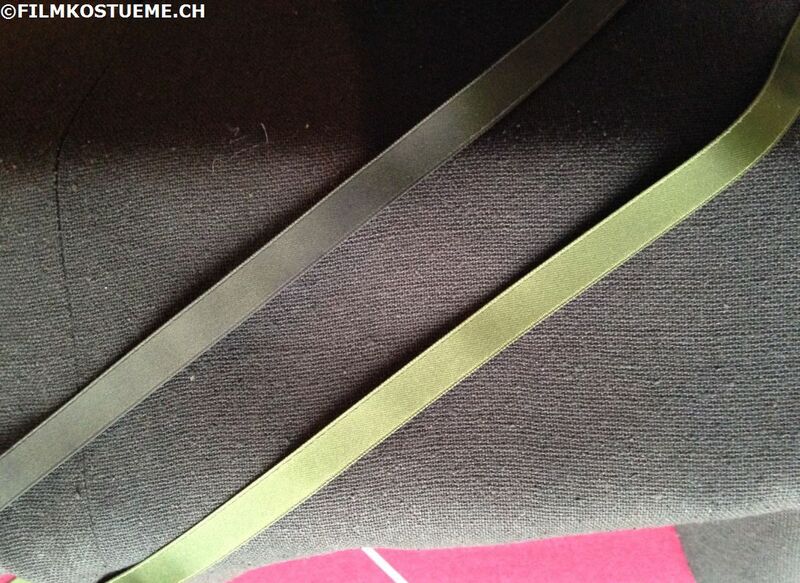 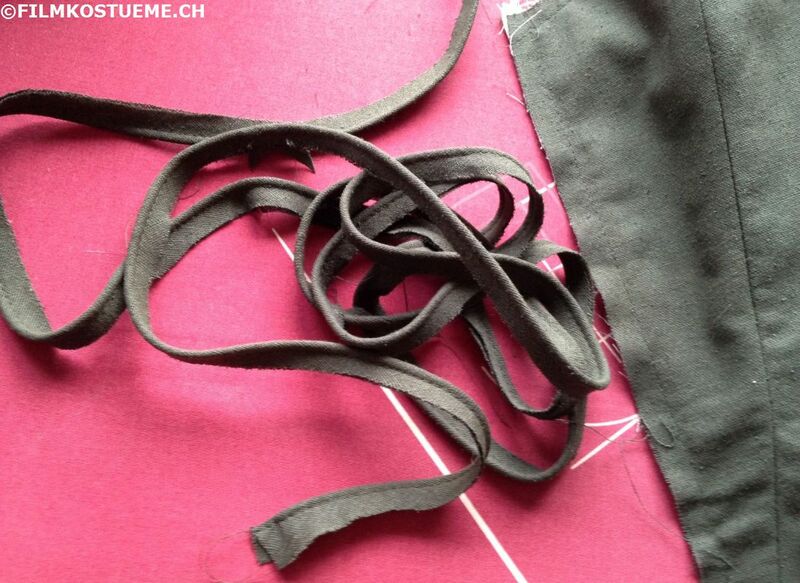 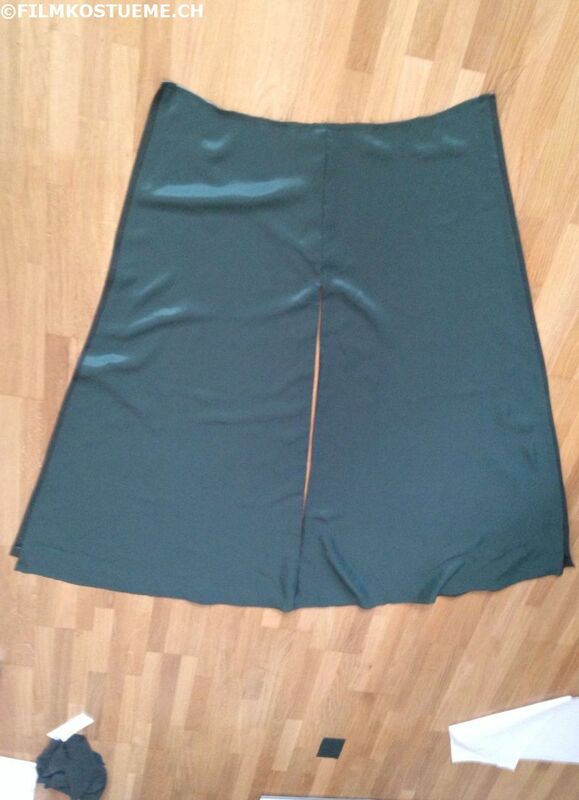 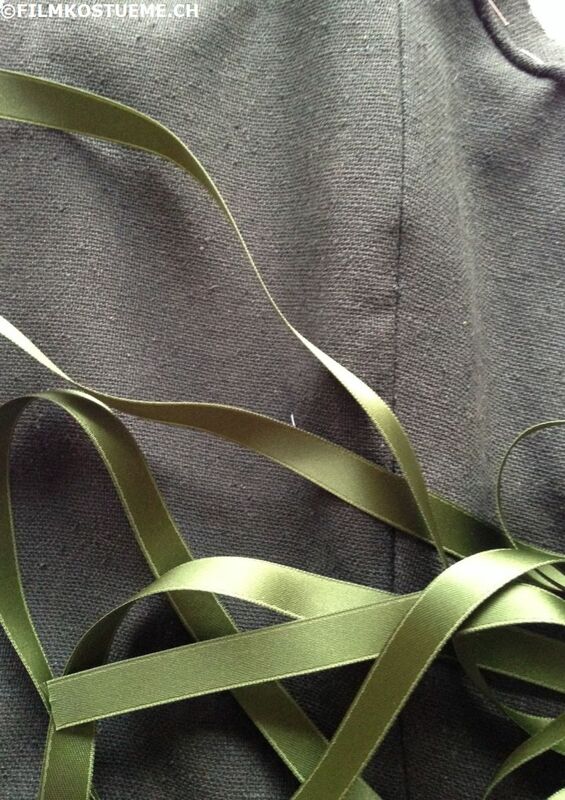 And the lining for the skirt part. 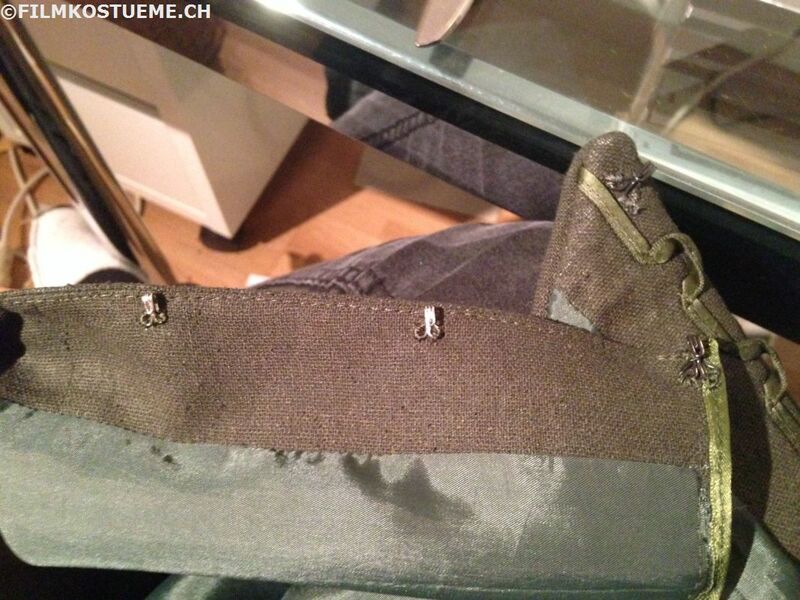 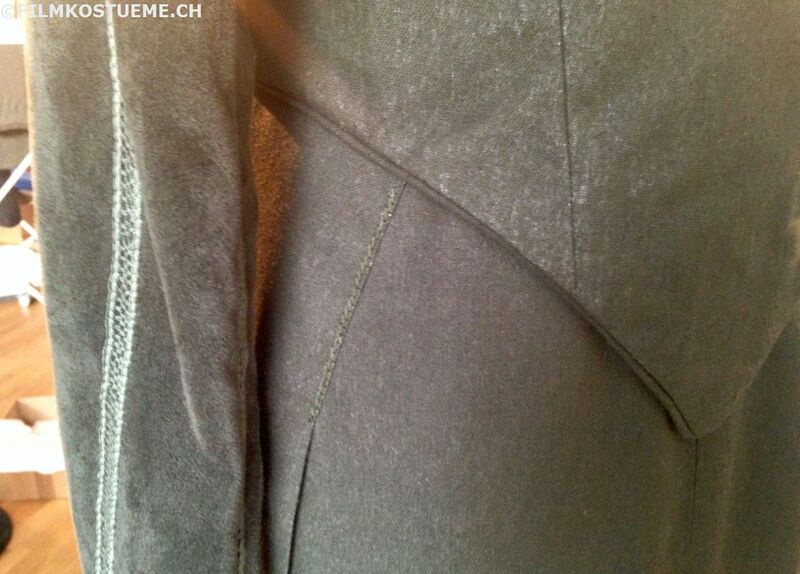 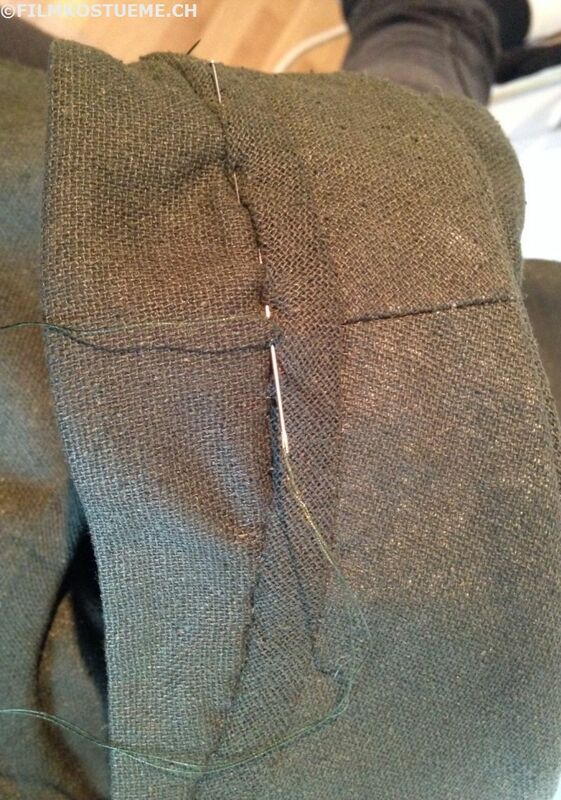 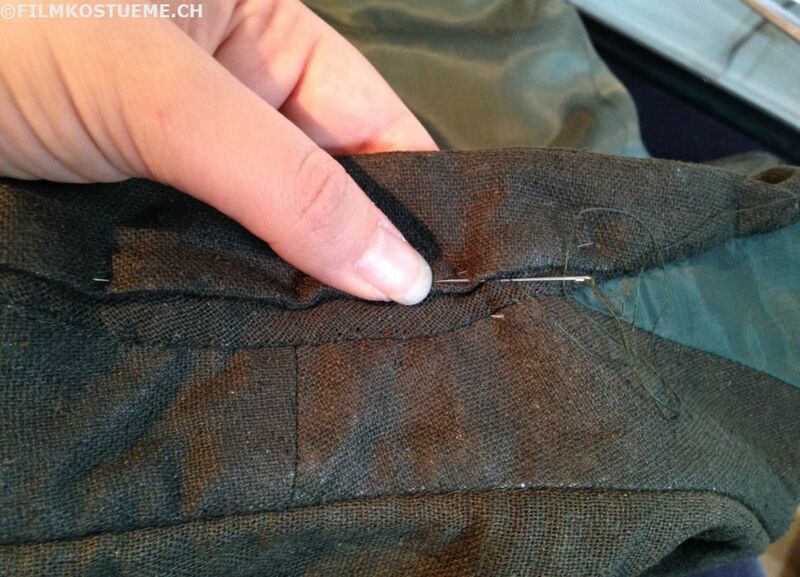 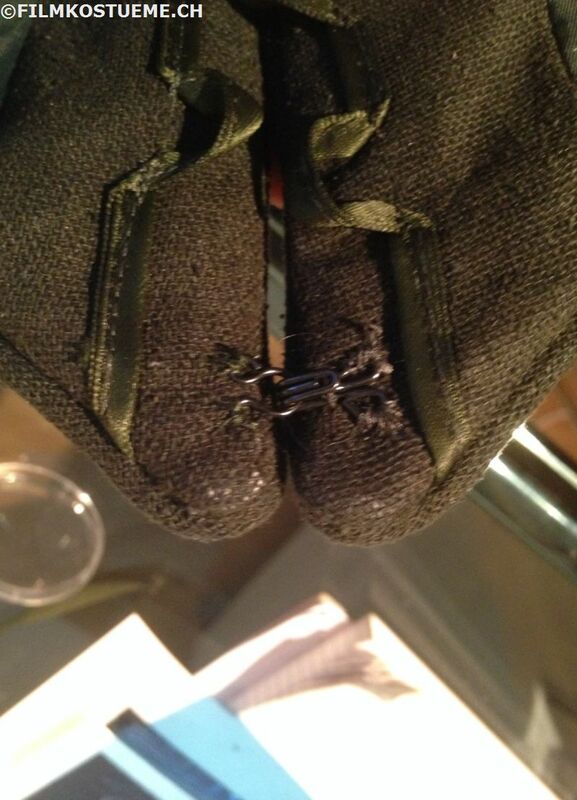 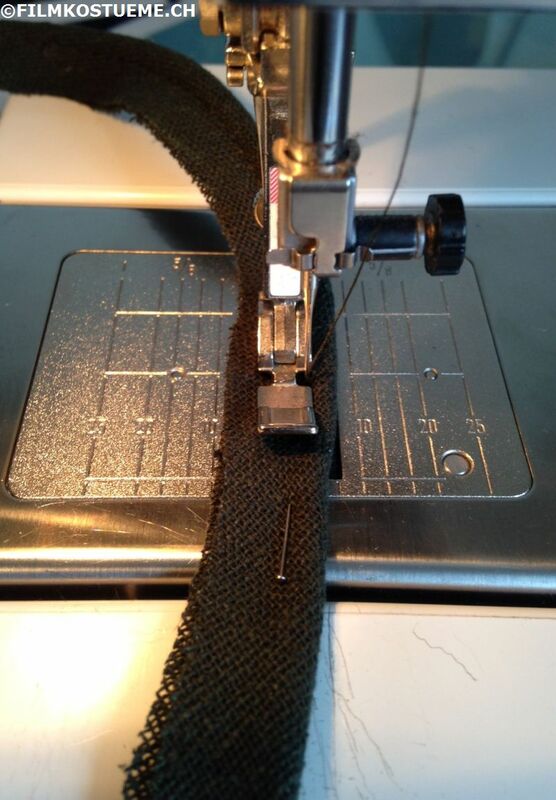 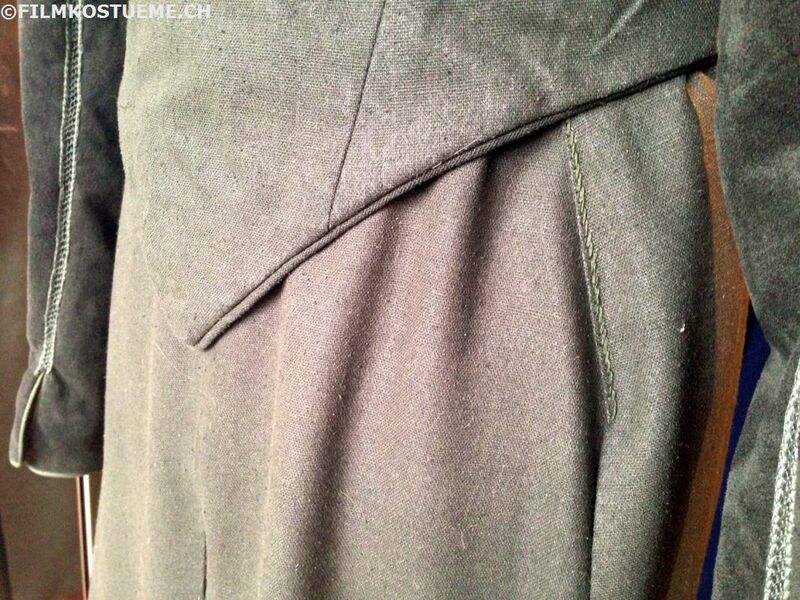 I still had to hand sew the hem facing and then hand sew the lining to it. 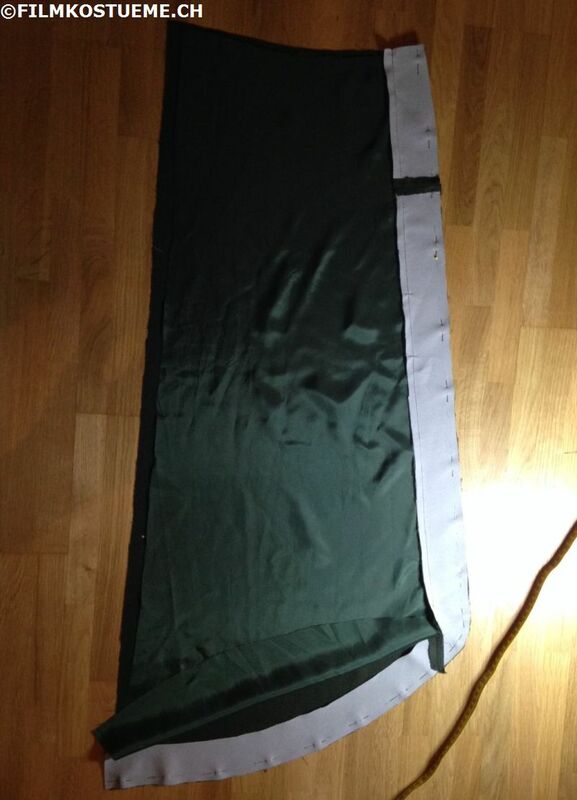 I wasn't happy with it at all.... it was far to bright and light. 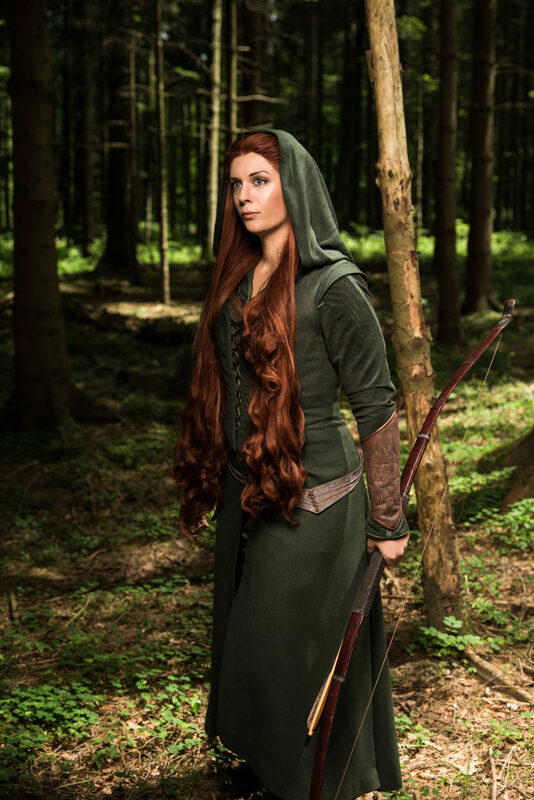 So I trided to dye it. 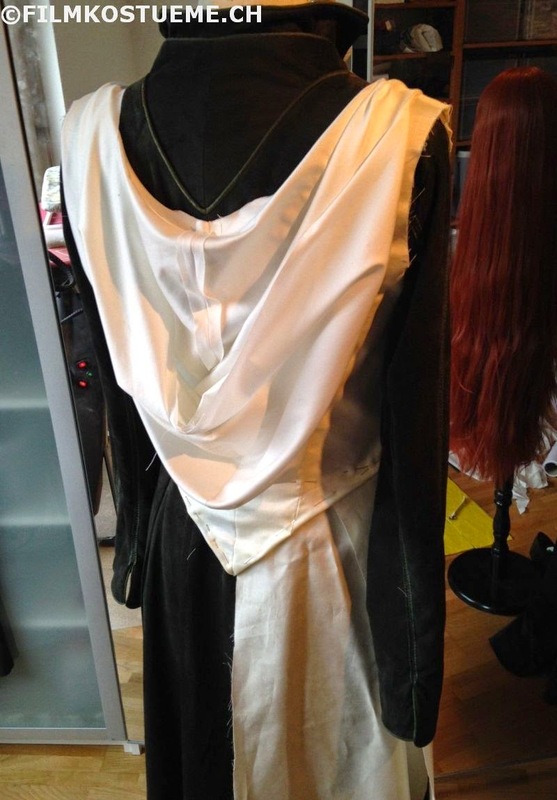 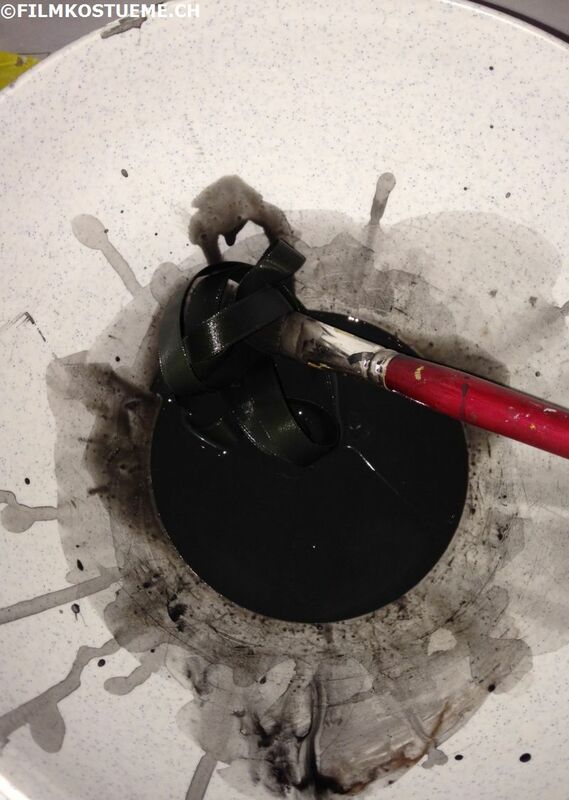 Well that wasn't so easy, I had to use a lot of black and brown acrylic paint with a smal amount of water untill I got a result. 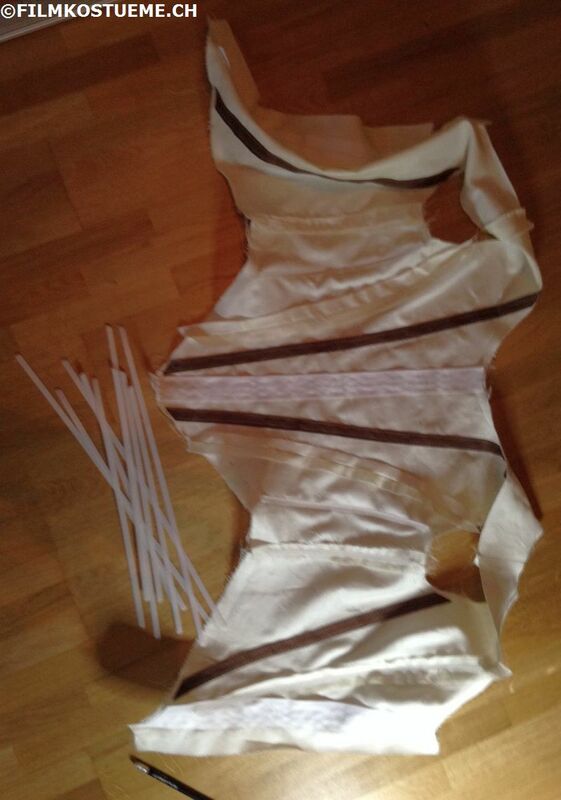 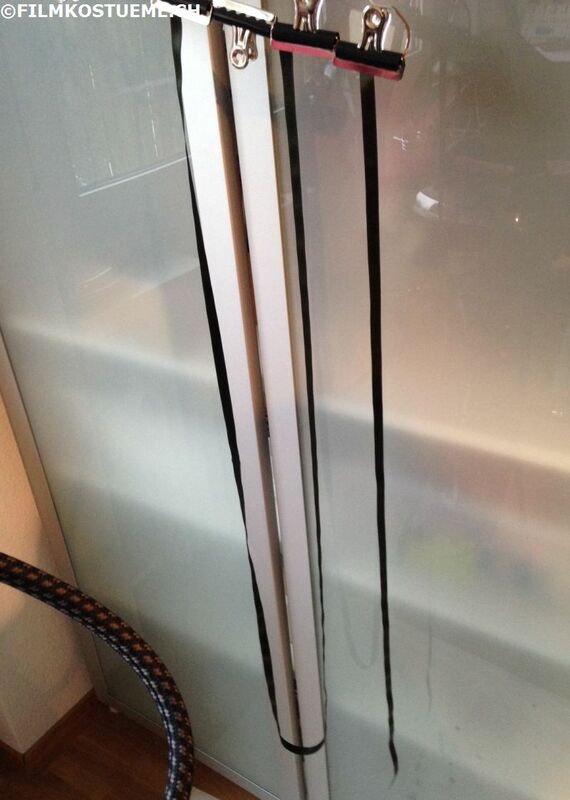 Below you can see the color bath and the ribbons hanging from a hanger to dry. 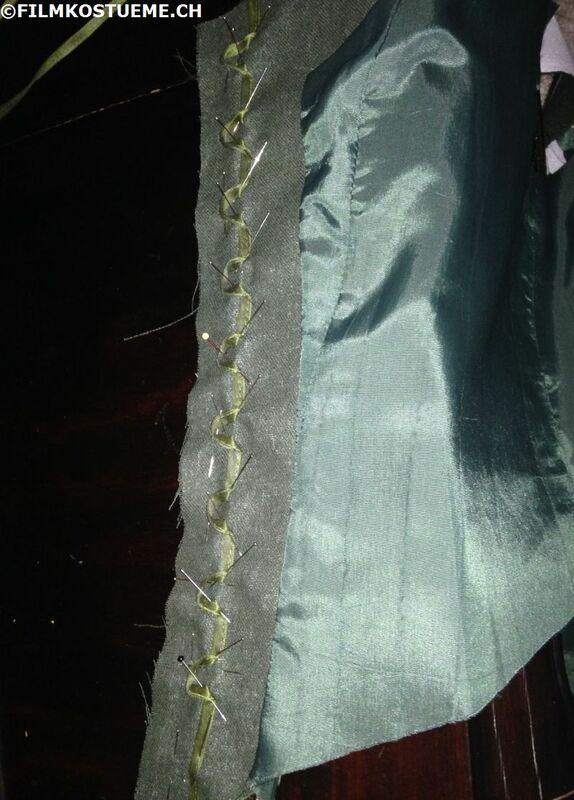 For the loops I used the same ribbon, only folded in half and sewn together. 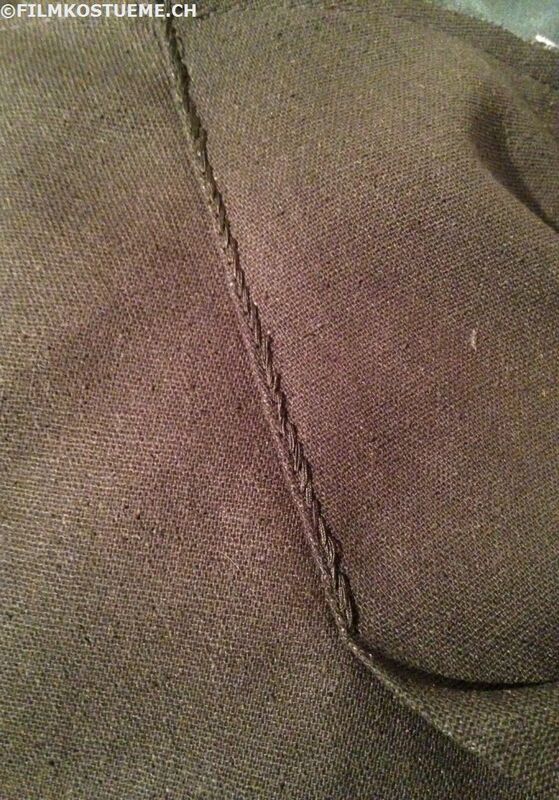 First I pinned it in place and then sewed it on. 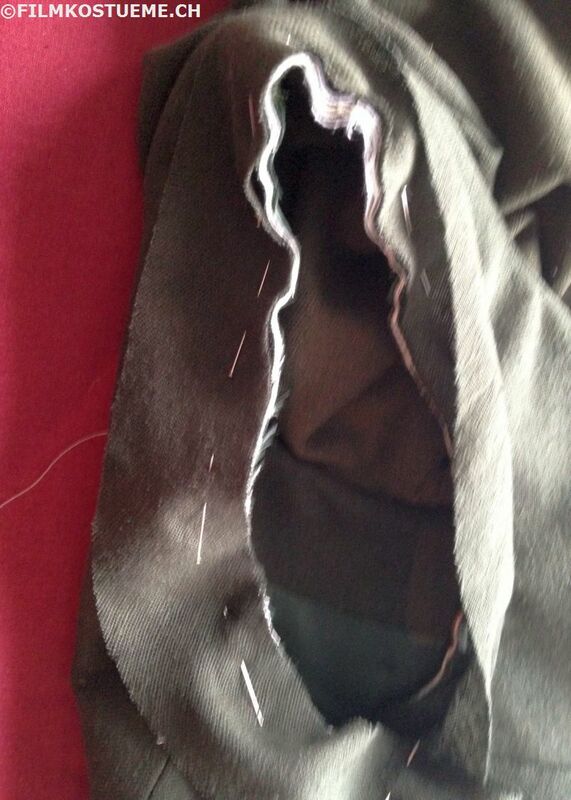 Edging the armhole: First I cut away the extra fabric around it, then I pinned and sewed the bias strip to it and finialy sewed the strip around the edge. 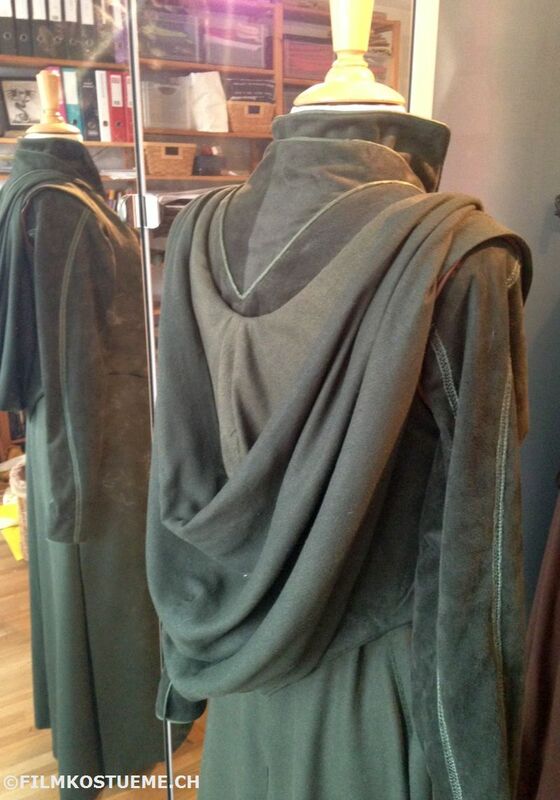 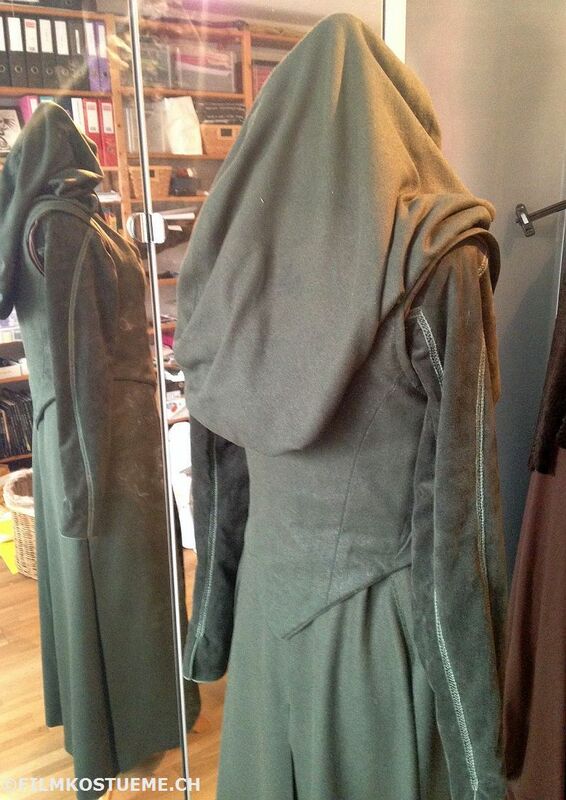 That's it for Tauriels traveling cloak. 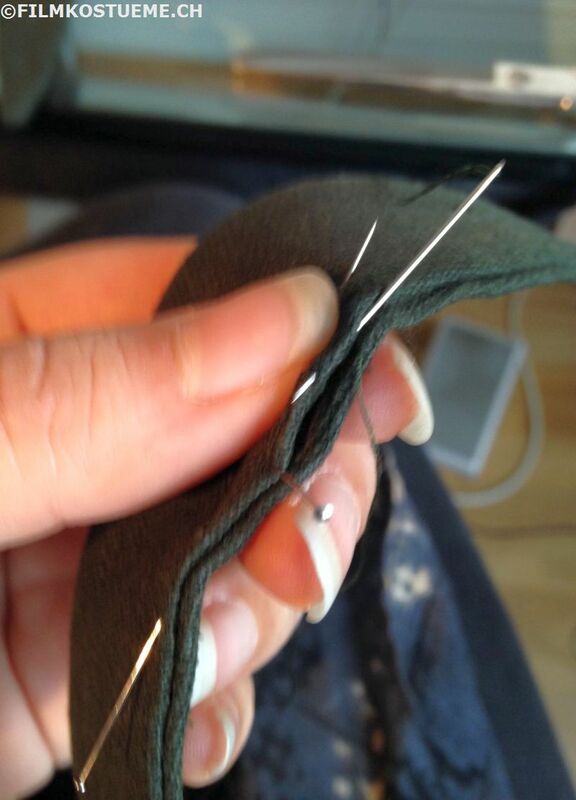 I hope you found my tutorial helpful. 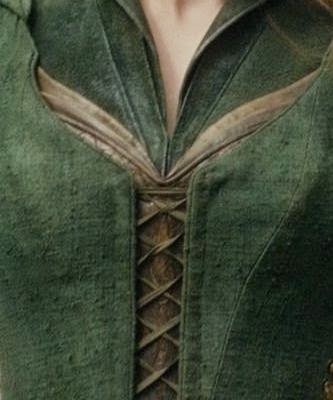 Please feel free to share it.